The annual SPAH Convention is America's biggest harmonica party! of all types of harmonica and all genres of music! August 13th through August 17th, 2019 in Tulsa, OK.
group than the SPAH community. Harmonica Club. The evening is yours, to settle in, say “hello” to old friends, meet new ones and enjoy the city. concert venue, and many SPAH attendees perform and attend. Always an excellent show! Others remain at the hotel to play in the hallways spontaneous hallway playing sessions. wherever a convenient location is available in the hotel. 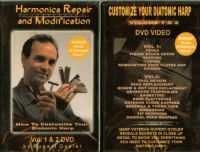 featured artists and others are also available, and usually at least one repair booth is open to repair harmonicas. unique instrument, piece of music or maybe a recording. You never know what will be there! change every year, so you never know what you might be able to learn! Starting on Thursday, each afternoon the ballroom is given over to the Teach-in. interesting to you. A must-see event for first-timers and returning conventioneers alike! the SPAH Youth Outreach Program, and hosted by an teacher experienced in working with young people. those who may not be as deeply fascinated by the harmonica as their partners. Reservations required. to bring together harmonica club leadership and manufacturer's representatives. Reservations required. what’s happening at SPAH, and attendees have an opportunity to ask questions. for your music player, keyboard or other gear, you must bring all needed cables or adapters for these personal items. you will find old friends and meet new ones! as the ballroom concerts let out. There are separate sessions for blues, bluegrass, country and jazz. These often run well into the wee hours, all players are welcome. featuring some of the finest harmonica talent from across the USA and around the world. Concerts are open to the public for a small fee, payable at Registration or at the door. Youth Scholarship Fund. Many attendees like to dress up for this final celebration together. See you at the next SPAH Convention!